Solihull police are calling on drivers to protect their cars after more cars were targeted over the weekend. Picture by West Midlands Police. SOLIHULL police are urging drivers to be wary after so called ‘Corsa Cannibals’ struck again. Thieves stripped bonnets, grilles and headlights from four Corsas over the weekend, bringing the total number of reported offences in recent weeks to 11. 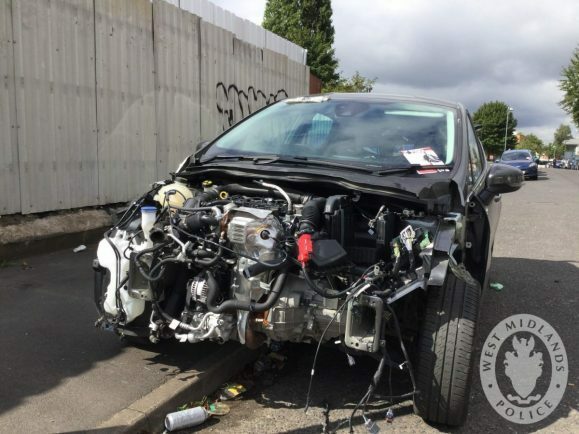 Police say thieves are able to quickly and efficiently remove front-end parts from Vauxhall Corsas without causing any damage. The phenomenon first hit nationally back in 2013, and the term ‘Corsa Cannibal’ was coined. Hundreds of other offences have been reported elsewhere in the country, but the craze has remained relatively unheard of in the West Midlands until recently. Now the force is urging drivers to be aware of the trend and think about how they can protect their vehicle, or make it inaccessible to thieves. Mark Silvester, head of crime prevention at West Midlands Police, said: “This method of theft is unusual in the West Midlands, but we’ve seen a flurry of offences in a short space of time. “I would urge drivers to park their cars in well-lit areas. Make sure the car is locked, and if your car has an alarm, make sure it is set. “If you have a garage try and use it or, if that’s not possible, park up as close to a garage door or wall or even another vehicle if you can. Police say the Vauxhall Corsa model is targeted by crooks because of their popularity, especially with younger drivers, meaning they are more likely to be involved in a collision with drivers after a cheap fix. The end destination for some of these stolen parts will be the second-hand market, perhaps through ‘chop shops’. Anyone with information about chop shops or car thieves operating in their area should contact police on 101.